Tumblr for iOS has just been updated. The new and updated Tumblr 3.4 for iOS brings enhancements to discovery feature of the app. Now you can search tags and blogs right from within the Tumblr app. You also get to see the trending blogs and tags and can also follow the blogs for any tag that you search. These updates significantly enhance the discovery feature in Tumblr iOS app and makes it even more interesting. Thanks to these updates, you can now find new and interesting blogs easily. 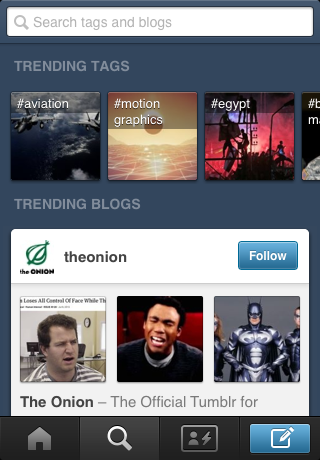 The trending tags and trending blogs feature makes it easy to find out what’s hot on Tumblr at the moment. On top of it, there is a search bar that you can use to discover the tags or blogs of your interest. Each result comes with a “Follow” button next to it, making it easier to follow that blog.